Scheduling meetings is a necessary chore we face in business. Managing multiple person’s calendars and finding a good time to meet involves many back and forth emails. This is especially true when the persons you’re trying to meet with are on another electronic calendaring system. To tackle this problem, I looked at Tungle last week. Now let’s look at a similar scheduling application: TimeBridge. TimeBridge’s approach for addressing this frustrating issue comes from research involving personal assistants. In my phone interview with TimeBridge CEO Yori Nelken, Mr. Nelken said the company spent hours interviewing personal assistants to find the insider’s tips and tricks for streamlining the scheduling process. The TimeBridge application is not just a calendar view with all attendees’ free/busy data overlaid on each other. They have built a meeting organization system with some handy add-ons to make it a powerful scheduling platform. Currently TimeBridge supports two major calendaring platforms: Microsoft Exchange/Outlook and Google Calendar, including Google Apps for Your Domains. The TimeBridge application works best when your contacts with whom you wish to meet ‘connect’ their calendars to TimeBridge. This is done on the Microsoft side by downloading/installing an Outlook toolbar. With Google, you enter your Google sign-on credentials or you go through a process to give TimeBridge access to your Google Calendar. Most privacy-conscious people will prefer the latter method. Connecting your calendar isn’t necessary to arrange a meeting with TimeBridge, it just makes the process easier. For this post, I’ll run through the process assuming no participants have ‘connected’ their calendar to TimeBridge. 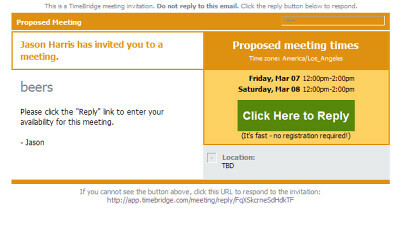 To begin scheduling a meeting, log in to TimeBridge and click “Schedule a Meeting”. Next, enter in the participant’s email addresses, your meeting topic and proposed meeting time(s). You can also add an optional conference call number at no charge. Click “Send” and the email invitations are sent out to attendees. You are also presented with an option to schedule a web conference with WebEx. The recipients get a message with an invitation to pick which of your proposed meeting times works best for them. They mark each time slot with their preferences based on their schedule. After the attendee marks their preferences, a message is sent back to the meeting organizer where he/she finalizes the meeting time, based on everyone’s provided availability. Finally, all attendees receive an email that contains a meeting notice that can be placed on their respective calendars. Upon finalization of the meeting, the originator is presented with a link to schedule a reservation (if needed) with OpenTable – an online restaurant reservation service. Mr. Nelken said the company received funding in December of 2005 and began operation in January 2006. Their team of 24 has seen their usage double over and over about 4 times. They are targeting growth amongst users, rather than engaging CIO-types and IT shops. TimeBridge has forged a relationship with Google and are providing Google a foot-in-the-door with enterprise customers who are looking at Google Calendar as a possibility for their organizations. To monetize the product, they have a very innovative approach. The optional conference call service is a revenue sharing agreement they have set up with the calling service providers. This gives the company the opportunity to provide customers with a no-advertisement (and potentially annoying) call service and on the back-end, TimeBridge makes money too. Additionally, the optional web conference option when arranging a meeting is an agreementw with WebEx whereby TimeBridge gets a fee for the new-users sign up. Following the typical web 2.0 web service model, Nelken stated at some point they will have a premium package, but basic functionality will always remain free. Tungle required a download and install of an IM-ish application that showed you your contact’s availabililty. I like that TimeBridge is an Outlook add-in bar, keeping me within Outlook during the scheduling process. Another interesting feature with TimeBridge is the ability to show your free/busy data on your website and/or social network. You can register with TimeBridge and get either a widget or embed-able HTML code that you can use on any website. This might be advantageous for a busy person to show their free/busy data directly on their website for all those who want to schedule a meeting with them. TimeBridge creates a process for meeting scheduling that is easy and conducive to how meetings are set up in the “real world”. The optional services makes scheduling meeting resources painless. Their integration with Google Calendar is a plus, however I’m waiting for them, like Tungle, to support iCal on the Macintosh. Nelken assured me an iCal application would be released in the near future. Can you schedule a meeting on daylight saving time start? I got an error message. Point of clarification, Andrew. TimeBridge is not reliant on MS Exchange. In fact, it can act as a Exchange replacement. My business (20 people) uses it with Google Calendar and it’s working really well for us–we can easily share our availability and now have no need for MS Exchange. This looks cool, but the benefit to Tungle (if it ever comes out) is that you don’t have to have MS Exchange. Small businesses rarely have it, and have limited ways to view each other’s calendars. I use TimeBridge for a while and it fully supports daylight saving changes for meetings in the same timezone and for meetings between different timezones. Its the only service that it absolutely accurate. The others don’t support daylight saving changes. Glad to see TimeBridge reviewed here. I’ve used it with Outlook for some time and it’s become part of my work day. Must say I’m now addicted.